This astilbe is known for having bright red plumes presented in upright spires. This clump forming perennial features elegant fern-like masses of basal, compound leaves. These leaves are sharp-toothed and emerge bronze but turn dark green with a scarlet tinge as summer progresses. The foliage can reach heights of 9-12” while its stems grow up to 15-18” tall. Astilbe Fanal care is fairly minimal requiring only that the plant be watered frequently. It should not be allowed to dry out because its leaves will turn irreversibly brown and crispy. They also require shading to reduce stress on the plants. They are also sensitive to salts and may become scorched or have its roots damaged should the salts build up. 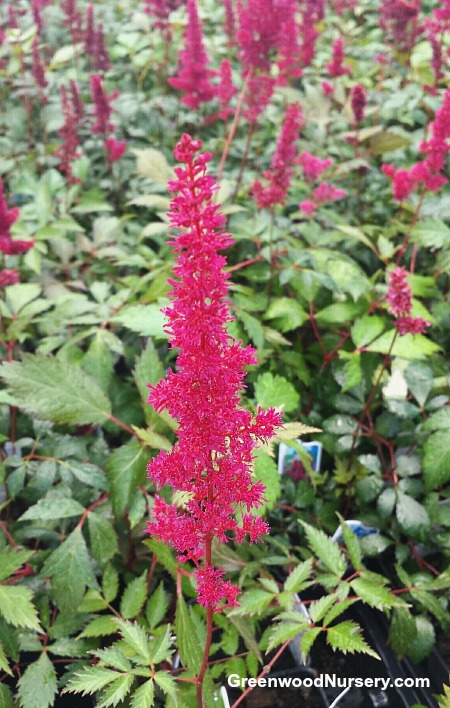 There are many red astilbe varieties and the fanal is one of the most popular. It requires rich, fertile soils and blooms in early summer. It is easy to grow and has a medium growth rate. This award winning Fanal poses no serious problems. The red astilbe bouquets attract bees and hummingbirds, they are also deer and rabbit resistant. The fragrant plant can be planted as a border plant and the showy blooms used as indoor flowers in a vase. They can do well as plotted plants and the mass foliage is perfect for woodland gardens. Great companion plants are Carex varieties and Dicentra for contrasting hues and the Deutschland Astilbe. It should be noted that when planting these astilbes, the eyes are just below soil level. Fanal Astilbe is growing in 3.5 inch pots. Orders shipping to AZ or CA may be bare rooted before being prepped for shipping.